A damp and windy Diwali, though. It’s been raining and blowing a gale for the last couple of days, so the loud noise and heavy smoke that invariably accompanies Diwali is missing this year. (Yay! 🙂 ) We realized we couldn’t place diyas outside either because they would go out, so we made do with just the (waterproof) paper lanterns outside, and only a few diyas at important spots. A very subdued affair, indeed. As usual, I tried clicking pictures, but there was really nothing new to capture this time. 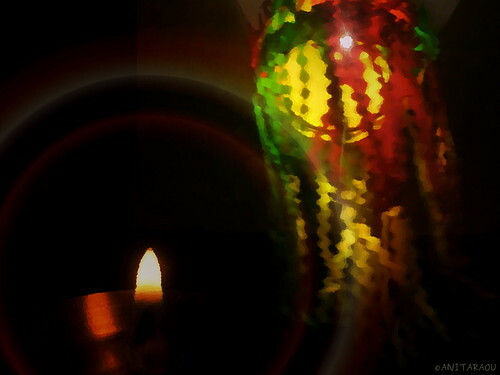 The paper lanterns just wouldn’t stay still, so I ended up making a oil-painting-like composite from the blurry paper lantern and a diya. 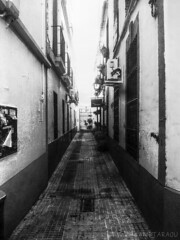 This entry was posted in Light and tagged Blur, Composite, Diwali, Diya, Festivals, Lanterns, Photography. Bookmark the permalink. which I love!! Darn weather!